Bill Hodapp leads a discussion on medieval texts. The Benedictine Commons campus gathering space was packed with activity during a recent afternoon, as people tried their hand at centuries-old techniques for making books. St. Scholastica held a two-day workshop in early February that gave attendees a chance to learn about the Saint John's Bible and get hands-on experience with traditional bookmaking techniques. Participants watched professional demonstrations of calligraphy and gilding (applying gold leaf or gold paint), then had the opportunity to try it themselves. They experienced the ancient art of papermaking, learned about making ink and pigments, and practiced writing with quills and drawing Celtic knots. Once their works of art were complete, they were able to pack everything into a folder with a wax seal. Lutenist Edward Martin provided atmosphere with baroque lute selections, and Dr. William Hodapp led discussions of medieval manuscripts. WDIO-TV Channel 10 covered the event; here is a Facebook photo album with a few highlights.St. Scholastica is hosting a Heritage Edition copy of the Saint John's Bible during the 2018-19 academic year. Commissioned by Saint John's University and the monks of Saint John's Abbey in 1998, the Saint John's Bible is the first handwritten Bible to be published in 500 years. It features 160 illustrations by six artists, and 1,150 handwritten pages written by six calligraphers. The creation of the Bible inspired the publication of the Heritage Edition, a full-size, museum quality reproduction of seven-volume collections to be shared with the world. In honor of the 125th anniversary of the founding of St. Scholastica Monastery by the Benedictine Sisters, the College hosted Volume 6 of the Heritage Edition, Gospels and Acts, during the first half of the academic year. During the spring semester, the College is hosting the Pentateuch volume, which features illuminated text from the first five books of the Old Testament. The two-day workshop also included a presentation by guest speaker Jim Triggs, executive director of the Heritage Program, who spoke on "Faith, Reason and The Saint John's Bible." On Saturday, a panel discussion, "From the Good Book to Facebook: Word & Image in a Media Rich World" featured St. Scholastica faculty members Kim Kruger, M.D., director of the Physician Assistant program; Denise Starkey, Ph.D., associate professor of Theology and Religious Studies; and Zachary Via, Ph.D., assistant professor of Chemistry. The day wrapped up with a Visio Divina led by Dr. Barbara Sutton, professor at Saint John's School of Theology & Seminary. 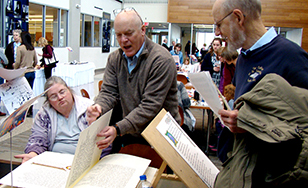 The Saint John's Bible is available for viewing daily in the St. Scholastica Library and will be featured at other public events throughout the year. For a schedule and details, visit css.edu/Bible.